Game designers around the world have been inspired by the Leap Motion Controller’s incredible speed and accuracy to create games that take advantage of our unique 3D interaction technology. Last week, we caught up with Patrick Hackett – a game designer with popular indie developer Double Fine Productions – about his creative process in developing for the Leap Motion Controller. Double Fine is widely known for creating quirky, innovative games that capture the public imagination. Their debut app for Leap Motion is the score challenge game Dropchord, which allows you to become a master DJ – dodging scratches, collecting notes, and jamming to an original electronic soundtrack. During our visit to Double Fine’s offices in San Francisco, we were invited behind the scenes to meet some of the amazing people who brought Dropchord to life. When did you first experience Leap Motion, and what was your initial reaction? Leap Motion first sent us some controllers in February and I think our initial reaction was the same as everyone who uses it. 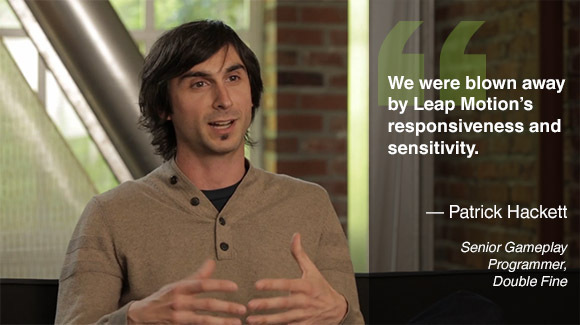 We were blown away by Leap Motion’s responsiveness and sensitivity. Jeremy Mitchell, one of my colleagues, had it set up at his desk initially and we were fighting over who got to use it next. Both of us ended up taking controllers home and creating demos over the weekend because we were so geeked up to use it. What do you want people to feel when they’re playing Dropchord? Dropchord was built with the hope that players feel like they’re playing a game inside a music visualizer. While it’s a smaller experience compared to larger music games like Rock Band or Dance Central, the original music and availability on Leap Motion gives it a great new feel. How did you pick the music for the game? The original prototype for Dropchordwas created with the Deadmau5 track “Some Chords.” We used that as reference for the type of music we wanted throughout the game, trusting that some of our friends (who we contracted the music out to) would deliver the same style. In my opinion, they couldn’t have done it better. They understood what we were trying to achieve and created some truly incredible tracks. Tracks that, even after listening to them hundreds of times as this point, still get my head bobbing. What types of music might we see in future versions of Dropchord? We’re definitely open to the idea of future versions containing different types of music. In fact, we had some Lady Gaga in the original prototype at one point and it worked pretty well! What Leap Motion game do you want to make next? I’d really like to make a Leap Motion game that’s more gesture-based. Dropchordis an excellent showcase of the precision, but I’d love to make a game that’s more about the movement of your hands and fingers instead of the positions.